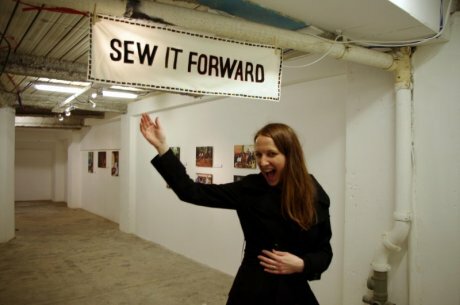 Our recent Sew It Forward event at Divine Chocolate’s pop-up shop was, if we do say so ourselves, a huge success. The evening, a celebration of Fairtrade Fortnight and International Women’s Day, was also a collaboration with Oxfam who came along to talk about their Get Together campaign. Arranging a Get Together is simple: team up with friends and do something you love to raise money to help transform the lives of women living in poverty worldwide. 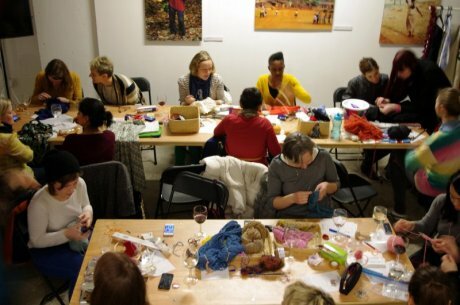 Guests at our event came together to eat Divine's Fairtrade chocolate, drink wine, knit, mend sew and chat - what's not to love? 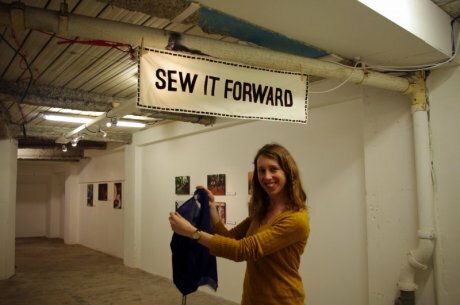 We launched Sew It Forward in November to encourage people to share their sewing, knitting and mending skills. In the four months since the launch, and with close to zero budget, around 100 people have learned new skills. 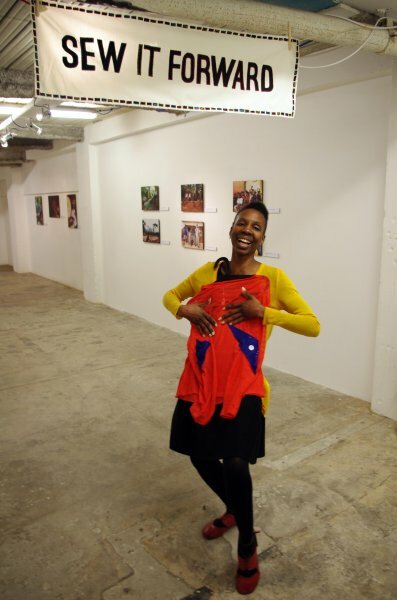 This has given a new lease of life to dozens of garments that might otherwise have been discarded by their owners. We think it's a crime to throw away clothes that can be saved: at best they are recycled; at worst they end up in landfill. Donating to a charity shop isn't much good either – not many charity shoppers buy something that’s broken so it would end up being recycled. Such a shame when you consider that a little time and TLC can increase a garments life span by a few years. Ahead of the event we had asked Fairtrade favourites People Tree and Komodo if they could donate some clothes to our event. But we didn’t want garments in good condition – we wanted items that were damaged which therefore could not be sold. They both came up trumps and sent us a selection of gorgeous pieces that needed a bit of TLC. This included knitwear and dresses that needed to be stitched back to their former glory. 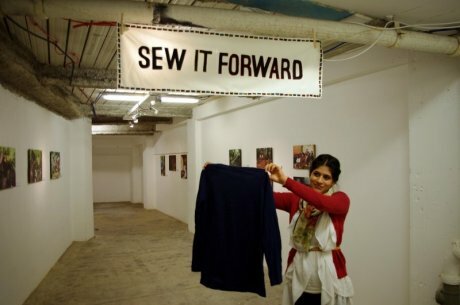 When guests arrived at the event they told us a bit about their sewing skills, what they wanted to learn and what they had bought with them to mend (they were asked to bring garments with them that needed some repairs). They were also invited to select a garment from the People Tree and Komodo collections that they could learn how to mend on the evening. At the end of the night, anyone who wanted to take home the piece they had restored could do so by making a donation to Oxfam’s Get Together fund. 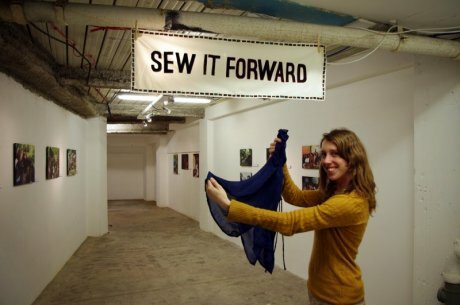 All this mending activity was made possible thanks to Greenfibres, who, in addition to selling organic undies, thermals and basics, also offer a great range of organic and naturally died yarn and fabric. The sewing and knitting materials they sent us were very high-quality and came in extremely useful on the evening. We were particularly excited about the darning mushrooms (The Good Wardrobe team is rather partial to a bit of darning). 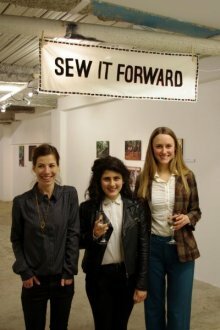 Pauline Milligan, Sew It Forward guest and food blogger from South London, learned the skills needed to mend three items on the evening that she would otherwise not have known how to fix: "loved tonight, thank you The Good Wardrobe and Divine. Mended socks, coat and bag and had 'sew' much fun in the process!" 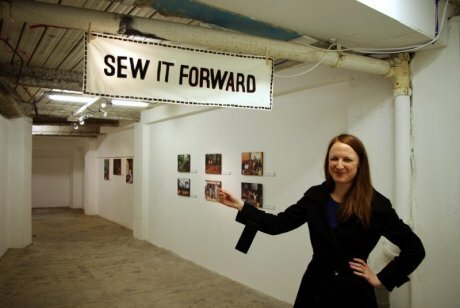 Voice over artist Anna Nolan not only picked up the darning basics on the night but, in the spirit of Sew It Forward, she even passed on her new-found skills to another guest: "amazing to learn a new skill and come away with a wearable garment. Thank you...a wonderful evening". 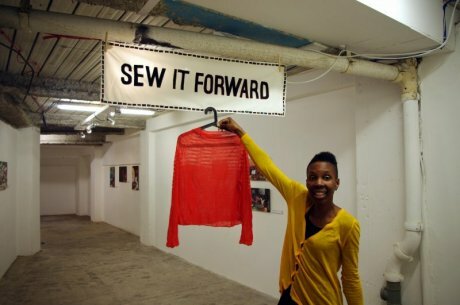 The project isn’t just about sharing sewing skills or even saving clothes from landfill; it’s also about style. If we know how to mend clothes or knit new ones we have the tools to keep our clothes looking stylish for longer; we can restore a garment with loose hems and missing buttons to it’s stylish former glory; and we can alter our clothes to fit our bodies (not attempt to alter our bodies to fit them). On top of all this, being creative and making stuff with our hands is proven to make us feel good (a bit like eating chocolate) and increase our wellbeing. Oh yes, and you can save money too. The combination of sewing, wine and chocolate was a winning formula and when the time came to clear up, guests were hard to budge, so happy were they sitting, chatting, darning and knitting. Thank you again to everyone who came to the event: to Juliette and Wendy who shared their skills; Divine for hosting; Oxfam for partaking and Greenfibres, People Tree and Komodo for donating beautiful products. For more information about Divine's Fairtrade chocolate visit www.divinechocolate.com. To learn about the Kuapa Kokoo co-operative in Ghana that co-owns Divine, visit www.kuapakokoo.com. You can find out more about The Oxfam Get Together at www.oxfam.org.uk/gettogether.